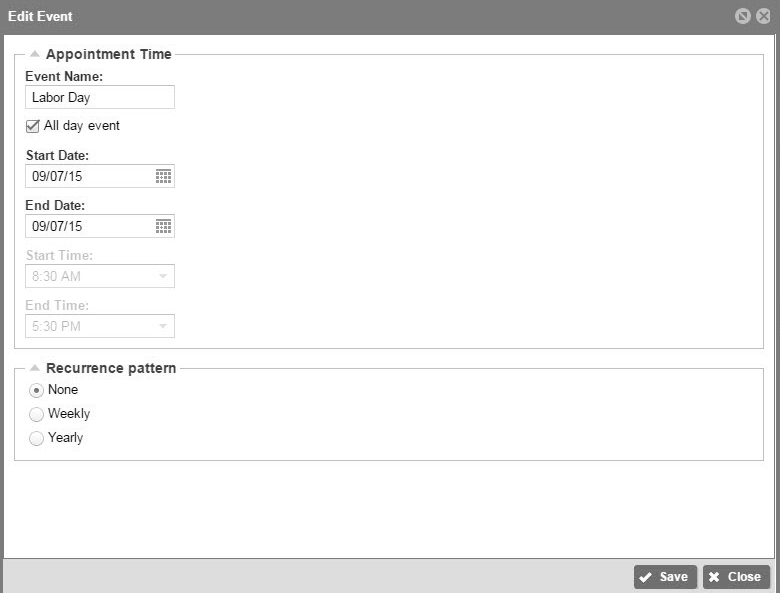 Time schedules are used by your Auto Attendand to route incoming calls based on the day of the week and/or time of day. Schedules are classified as either Business Hours or Holiday. This article provides instructions for how to modify, add and delete Time and Holiday schedules. How do I modify time schedules? How do I add a time schedule? How do I modify and add holiday schedules? How do I delete time or Holiday schedules? To learn how to modify the Auto Attendants, please visit the How to Manage my Auto Attendant Article. Auto Attendant – Business: This schedule defines the days and hours your office is taking phone calls. Auto Attendant – Holiday: This schedule defines the days your office is closed due to a holiday and not taking phone calls. Schedules are defined by events. Events represent days of the week and times of the day. If additional Site Schedules are defined, they will not impact Auto Attendant operation unless they are assigned to the Auto Attendant. User specific schedules can by implemented within My Rules in the My Phone Portal. A user may use one of the existing Site Schedules, or create and manage user unique schedules using schedules. If you expect to treat all incoming calls the same regardless of day or time, configuring a Time Schedule is unnecessary. During a Holiday Schedule, callers are routed based on the After Hours settings. A. How do I modify Time Schedules? Select a site from the list on the left. Click the Site Services tab at the top of the screen. Click Schedule on the menu on the left. Click the schedule to modify. To rename the schedule, enter the new name. Note, when modifying an existing schedule, you cannot change the Time or Holiday designation of the schedule. 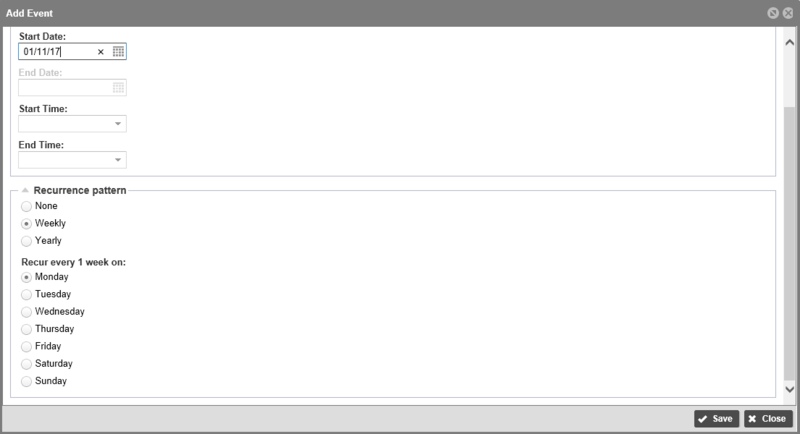 To modify an event, click anywhere in the Event row. Click Edit. The Edit Event window appears. Edit the event name. This is typically the day of the week for the event. Modify the start date and the end date. If this is a recurring event, these days can be the same. Modify the start time and end time for the event. This represents your business hours for this day and when callers will hear your business hours greetings (for Auto Attendants). Select the recurrence pattern for this event. 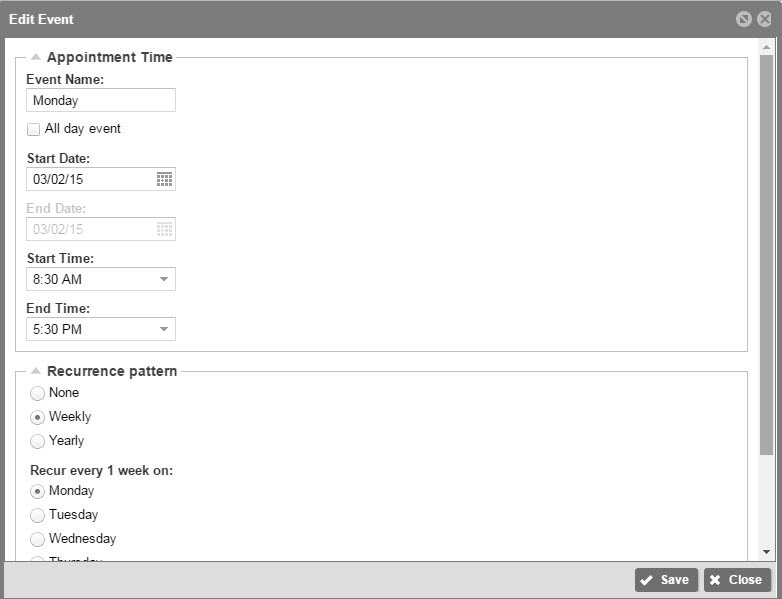 Select the weekly recurrence for events that should repeat each week on that day. Select the yearly recurrence for holidays. Select “None” for an occasion outside of a holiday – perhaps a special event day at your office. Select the day of the week to have this schedule reoccur on that day every week. Repeat steps for the remaining 6 days of the week. B. How do I add a Time Schedule? Enter the name of the Schedule and select either “Time” or “Holiday”. Click Add to add an event. Enter the event name. This is typically the day of the week for the event. Enter the start date and the end date. If this is a recurring event, these days can be the same. Enter the start time and end time for the event. 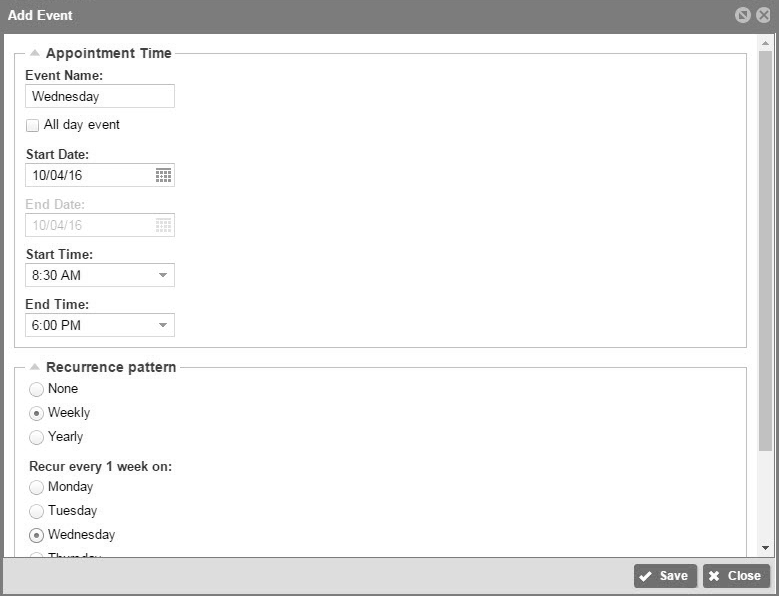 Select the weekly recurrence for events that should repeat each week on that day. Select the day of the week to have this schedule reoccur on that day every week. 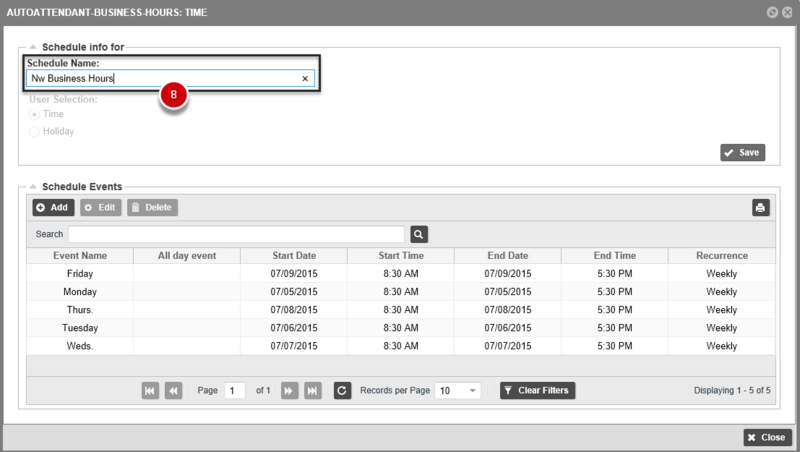 Assign the time schedule to its service, such as Call Center, Selective Call Forwarding or Auto Attendant. Select After Hours to allow callers to reach users by dialing their extension any time during the after hours time schedule. C. How do I Modify and Add Holiday Schedules? Holiday Schedules contain multiple events. These events represent the holidays that your company is closed. It is recommended to create a new holiday schedule each year to ensure the dates and days in the schedule reflect when the offices are closed. If the holiday schedule is assigned to the Auto Attendant Service, callers will be routed to the After Hours settings on your Auto Attendant. To edit a Holiday schedule, click the holiday schedule to modify and click Edit. Note, when modifying an existing schedule, you cannot change the Time or Holiday designation of the schedule. To add a new holiday schedule click Add. Enter the new name of the schedule or modify the name. For example, “Company Holidays”. 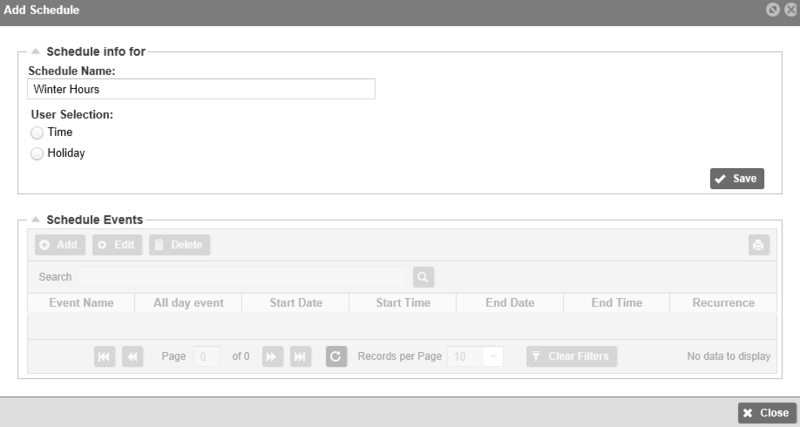 To modify an event, select the Event and click Edit. OR click Add to add new holiday events. Edit the event name. This is typically the name of the holiday. Select All day event if this holiday requires your office to be closed all day. Modify the start date and the end date. If this is an all-day event, just select the start day. Modify the start time and end time for the event. If this is an all-day event, these options will not apply. Select the yearly recurrence for holidays. If yearly, select either the date of the holiday or the day of the month the recurrence will take place. Repeat steps for any remaining holiday’s events on the schedule. D. How do I Delete Time or Holiday Schedules? Click the schedule (or anywhere in the row) to delete.